The AD9833 function generator can be used to provide various signals for electronic testing by serving as a function generator and it can be used in various sensing, actuation and time-domain reflectometry (TDR) applications such as for testing cables or for FSK or other keying application. 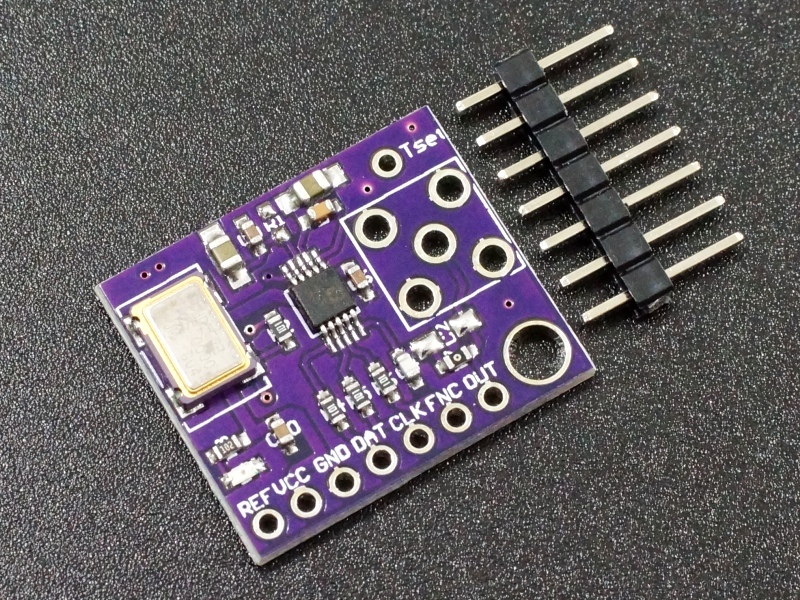 The module can operate from 2.3 to 5.5V and so is compatible with both 3.3 and 5V uCs. 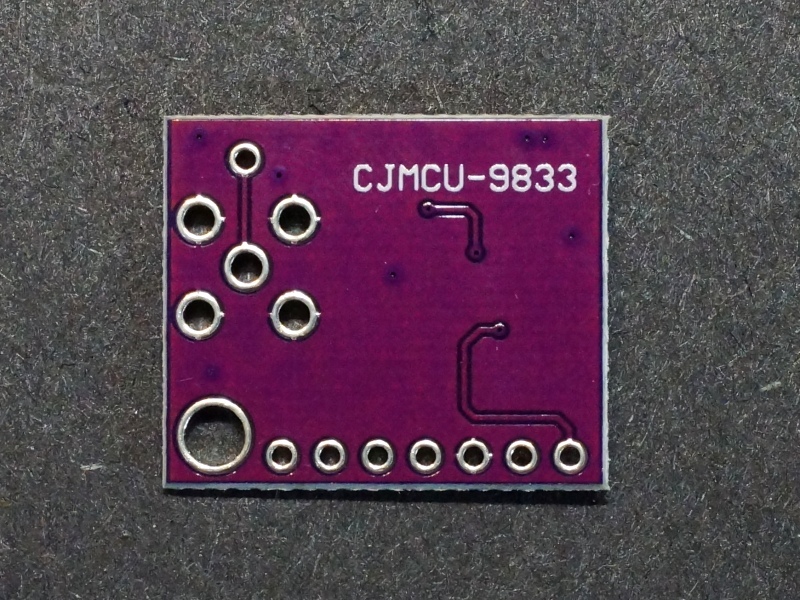 Internally, the AD9833 contains a 2.5V regulator and operates at 2.5V. 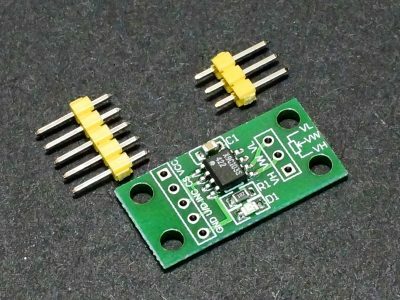 In the event that you want to operate the module at a Vcc voltage < 2.7V, the location on the board marked R1 which is normally open should be shorted so that VCC is connected directly to the CAP2.5V input which bypasses the internal regulator. A red LED illuminates when power is applied to the module. The AD9833 can be programmed to output either a sine, triangular or square wave. The AD9833 creates sine waves by the use of a numerically controlled oscillator, phase modulator, sin look-up ROM and DAC. The output DAC is a high impedance 10-bit current source DAC. A built-in 200 ohm load resistor converts the current to a 0.6Vp-p voltage output that swings between ground and about +0.6V. At frequencies above 1MHz, the signal amplitude starts decreasing. When the triangle waveform is selected, the sin look-up ROM is bypassed and the output of the NCO is sent directly to the on-chip DAC which provides a 10-bit triangular output. The triangle wave output will also be approximately 0.6Vp-p up to 1MHz and then start to decrease at higher frequencies. 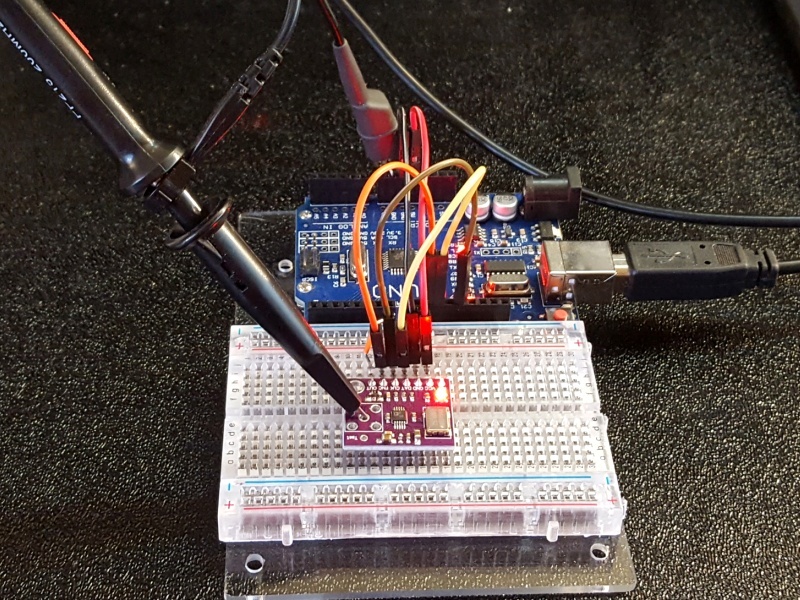 The square waveform is created by just sending the MSB (Most Significant Bit) of the DAC data to the output. Unlike the other two wave forms, the square wave output is a logic level and will swing the full range from ground to Vcc over most of its range. The output of the AD9833 is available in 3 places. On the header pin marked ‘OUT‘, on the center pin of the unstuffed BNC connector location which is surrounded by 4 ground pins and at the pad marked ‘Tset‘. The output of the module is not buffered. Depending on the applications, it may be desirable to add an op amp or similar buffer on the output to modify the levels and/or add drive capability. The output has a series resistor and capacitor location on the board. As-shipped, the resistor location is stuffed with a 0 ohm resistor. The larger C2 capacitor location next to it is unstuffed. If it is desired to AC couple the module, the 0 ohm resistor can be removed and a capacitor can be added to C2. 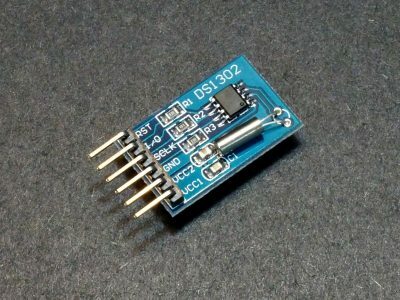 The module has an easy to use 3-wire SPI interface that uses Data, Clock and Load which is called FSYNC on the AD9833. The connections to the module are fairly straightforward. Connect the 3 SPI pins to the SPI pins on the uC. 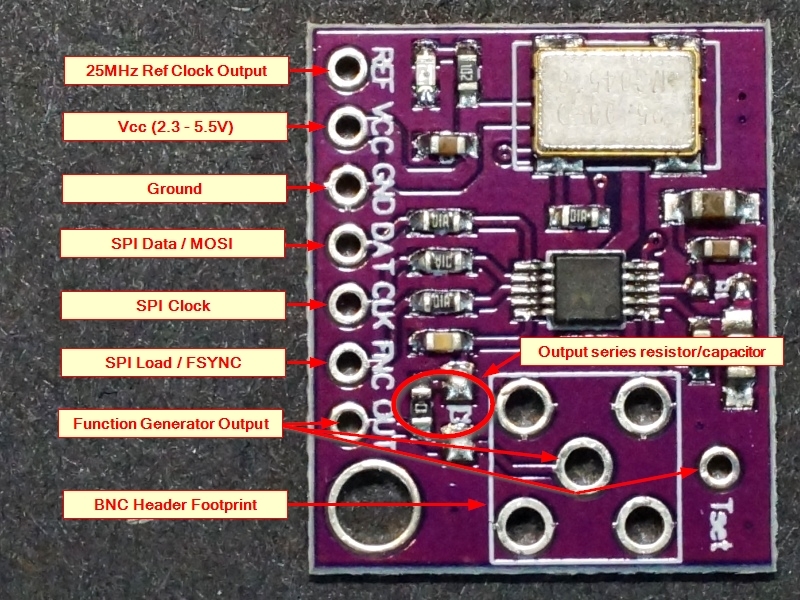 REF = 25MHz Reference clock from the on-board oscillator is output on this pin. 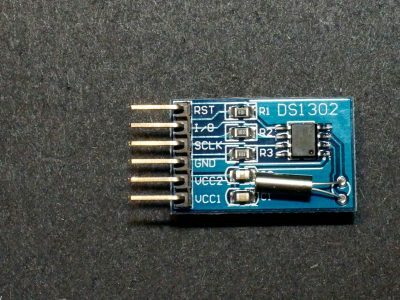 These modules have good build quality and generally work well, but don’t expect to run them up to the maximum 12.5MHz frequency spec of the AD9833. 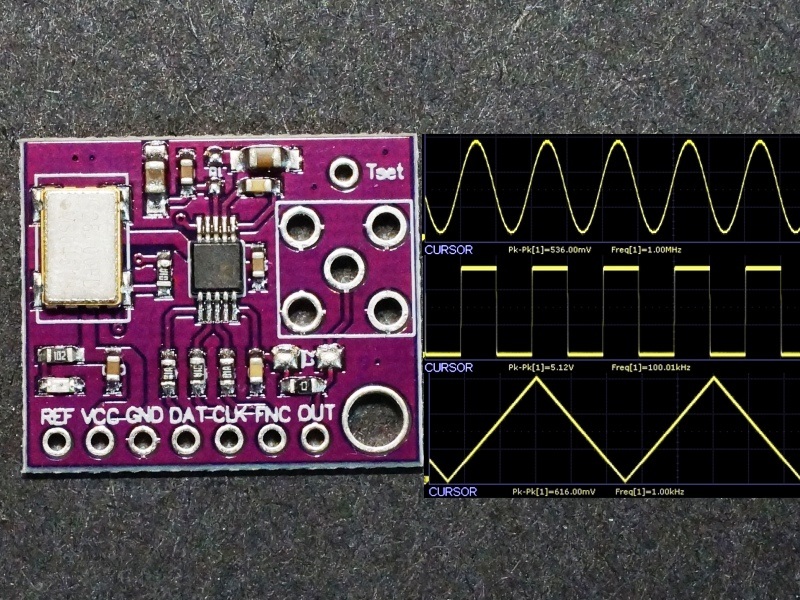 The AD9833 is a DDS (Direct Digital Synthesis) chip and as the output frequency approaches the clock rate, which is 25MHz in this case, the ability to reproduce the requested waveform starts to degrade. Stability is good up to about 1MHz and then the waveform start to degrade as the frequencies increase from there. Depending on the output type, the signal holds together reasonably well up to about 5MHz. Refer to the O’scope pictures below to get an idea of the expected performance. The frequency accuracy is good. On a sample basis we measured the following using the sine wave output. Below are some O’scope waveform captures showing typical performance of the three waveforms at several different frequencies. The measurements are taken at the BNC center pin location with a short ground probe contacting one of the BNC ground points. The first three show the sine wave output first at 1MHz with a p-p amplitude of 536mV, 5MHz where the amplitude has decreased to 216mV and the waveform is starting to show a little distortion and then at 9MHz where the amplitude is reduced further to 104mV and the waveform is starting to seriously deteriorate. These next three show the square wave output at 100kHz with an amplitude of 5.12V and then at 1MHz where the amplitude is still 5.12V but the edges are starting to show some roll-off and then at 5MHz where it is showing significant roll-off and amplitude has dipped slightly to 4.8V. The next two shows the triangle wave output at 1kHz with an amplitude of 616mV and at 1MHz with an amplitude of 156mV. This is not a trivial module to use due to the complexity of the output. Having access to an O’scope is highly recommended in order to determine what the output is doing vs. what you think it should be doing. If you are working without an O’scope, a frequency counter can help determine the frequency of the output. You can also feed the output of the generator into an analog input on a uC. By reading the data at a fast rate and sending it to the Serial Plotter window it is possible to capture the waveform. For this to work reasonably well, the frequency needs to be kept low. In the example here, we are capturing a 10Hz sine wave output of the AD9833. Here is a example of a simple program that can be used to capture the output. Connect the AD9833 module output to the A0 analog input of the uC, download this program and then open the Serial Plotter Window to see the result. Make sure to set the Serial Monitor Window to 115200 baud rate. The graph below shows the resulting Plotter Window output of the 10Hz sine wave. 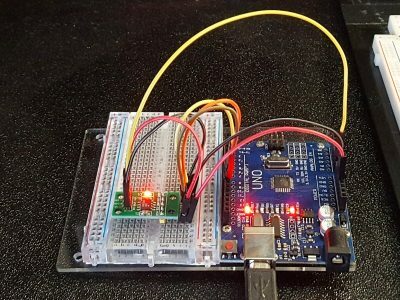 If you have two Arduino boards, you can run this program on one and the program below on the other which allows you to control the AD9833 at the same time. 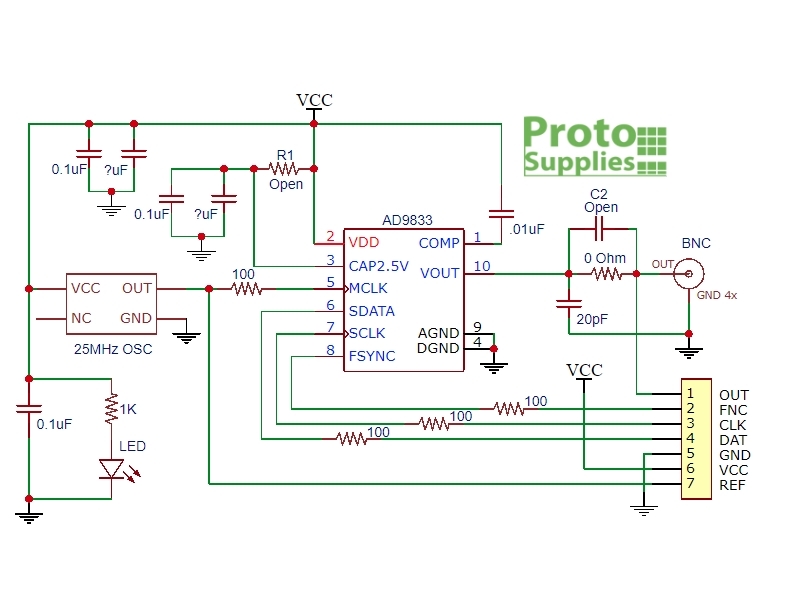 If you have a single board, you can set the waveform using the software below and then load the ADC capture program to see the resulting output. The program below uses the MD_AD9833 library which is available for download directly from the Arduino IDE. The program allows you to select the type of waveform to output and to set the frequency of the output waveform. Once the library is downloaded, a sample program is available which provides more insight into the advanced uses of the module but the logic can be a bit tough to follow. Once the program is downloaded and running, commands can be entered into the Serial Monitor Window. They can be entered either lower or upper case. Press enter to send the command to the uC. Once the uC receives the command, it will echo it back to the Serial Monitor Window to show that it got the command. delay(2);  // Give time for more characters to arrive. //  Subroutine to print the command set to the Serial Monitor Window.